Faith A mental factor that functions principally to eliminate non-faith. Faith is a naturally virtuous mind that functions mainly to oppose the perception of faults in its observed object. There are three types of faith: believing faith, admiring faith, and wishing faith. See Transform Your Life, Joyful Path of Good Fortune, and Understanding the Mind. Father Tantra A Tantra that principally reveals methods for attaining the illusory body. Feeling A mental factor that functions to experience pleasant, unpleasant, or neutral objects. See Understanding the Mind. Field for Accumulating Merit Generally, the Three Jewels. Just as external seeds grow in a field of soil, so the virtuous internal seeds produced by virtuous actions grow in dependence upon Buddha Jewel, Dharma Jewel, and Sangha Jewel. Also known as `Field of Merit’. Fire Deity The Deity to whom we make the burning offering, for example in the practice of Heruka. A Fire Deity can be either mundane or supramundane. Mundane Fire Deities are not real mundane beings but appear in the aspect of mundane beings. Firm apprehension A mental factor that makes its primary mind apprehend its object firmly. See Understanding the Mind. Five Buddha families See Buddha family. Five delusions In the context of blessing the inner offering, the five delusions are: self-grasping, attachment, miserliness, jealousy, and confusion. See Guide to Dakini Land. Five exalted wisdoms Buddha’s omniscient wisdom has five parts: (1) the exalted mirror-like wisdom, which perceives all phenomena simultaneously as a mirror reflects objects; (2) the exalted wisdom of equality, which realizes that all phenomena are equal in emptiness; (3) the exalted wisdom of individual realization, which realizes all individual phenomena directly; (4) the exalted wisdom of accomplishing activities, whose function is to accomplish all the activities of a Buddha; and (5) the exalted wisdom of the Dharmadhatu, which realizes the Dharmadhatu, the ultimate nature of all phenomena. Five heinous actions These are the five worst negative actions: killing one’s father, killing one’s mother, killing a Foe Destroyer, drawing the blood of a Buddha with harmful intention, and causing division within the Sangha or Dharma community. Also known as the `five actions of immediate retribution’. Five omniscient wisdoms See Five exalted wisdoms. Five stages of completion stage In general, this refers to isolated speech, isolated mind, illusory body, clear light, and union. Sometimes it is used to refer to the five stages of blessing the self and so forth. See Tantric Grounds and Paths, Clear Light of Bliss, Mahamudra Tantra, and Essence of Vajrayana. Foe Destroyer ‘Arhat’ in Sanskrit. A practitioner who has abandoned all delusions and their seeds by training on the spiritual paths, and who will never again be reborn in samsara. In this context, the term `Foe’ refers to the delusions. See also Hearer. Forgetfulness A deluded mental factor that makes us forget a virtuous object. See Understanding the Mind. Form See Form aggregate, Form that is a phenomena source, and Visual form. Form aggregate Includes all the objects of the five sense awarenesses—all colors and shapes (visual form), sounds, smells, tastes, and tactile objects. A person’s form aggregate is his or her body. Form Body The Enjoyment Body and the Emanation Body of a Buddha. The first is his or her subtle Form Body and the second, of which each Buddha manifests a countless number, are gross Form Bodies that are visible to ordinary beings. See Joyful Path of Good Fortune, Tantric Grounds and Paths, and Ocean of Nectar. Form realm The environment of the gods who possess form. Formless realm The environment of the gods who do not possess form. Form that is a phenomena source Form that appears exclusively to mental awareness, such as a dream mountain that appears to a dream eye awareness. See also Phenomena source. See Tantric Grounds and Paths and Ocean of Nectar. Fortunate Aeon The name given to this world age. It is so called because one thousand founding Buddhas will appear during this Aeon. Buddha Shakyamuni was the fourth and Buddha Maitreya will be the fifth. An Aeon in which no Buddhas appear is called a `Dark Aeon’. Four classes of Tantra Buddha taught four classes of Tantra: Action (Sanskrit Kriya) Tantra, Performance (Sanskrit. Charya) Tantra, Yoga Tantra, and Highest Yoga (Sanskrit. Anuttarayoga) Tantra. Each of the four classes of Tantra contains its own special techniques for transforming sensual bliss into the path to enlightenment. See also Tantra. See Tantric Grounds and Paths. Four complete purities A Tantric practice is one that possesses the four complete purities: (1) complete purity of place – the environment is seen as the mandala of the Deity; (2) complete purity of body – ordinary appearance of the body is prevented and the practitioner imagines that he or she possesses the body of a Deity; (3) complete purity of enjoyments – sense enjoyments are transformed into offerings to the Deity; and (4) complete purity of deeds – the practitioner regards all his or her actions as the actions of the Deity. See Great Treasury of Merit and Tantric Grounds and Paths. Four fearlessnesses Special qualities of a Buddha. A fearlessness is an utterly firm, ultimate realization that is entirely free from fear in expounding Dharma. There are four types: (1) fearlessness in revealing the Dharma of definite emergence, (2) fearlessness in revealing the Dharma of overcoming obstructions, (3) fearlessness in revealing the Dharma of excellent abandonments, and (4) fearlessness in revealing the Dharma of excellent realizations. See Ocean of Nectar. Four immeasurables Immeasurable equanimity, immeasurable love, immeasurable compassion, and immeasurable joy. So called because we practise them taking as our observed object all living beings whose number is immeasurable. See Joyful Path of Good Fortune and Ocean of Nectar. Four joys Four stages of bliss that are generated in the generation and completion stages of Highest Yoga Tantra. See Clear Light of Bliss. Four noble truths True sufferings, true origins, true cessations, and true paths. They are called `noble’ truths because they are supreme objects of meditation. Through meditation on these four objects, we can realize ultimate truth directly and thus become a noble, or Superior, being. Sometimes referred to as the `four truths of Superiors’. According to the Madhyamika-Prasangika school, there are two types of four noble truths: gross and subtle. This is because there are two types of self-grasping of persons, gross self-grasping of persons – grasping at a self-supporting, substantially existent person, and subtle self-grasping of persons – grasping at an inherently existent person. See also Sixteen characteristics of the four noble truths. See How to Solve Our Human Problems, Joyful Path of Good Fortune and Ocean of Nectar. Four opponent powers Four powers that are essential for successful purification: the power of reliance, the power of regret, the power of the opponent force, and the power of promise. See Joyful Path of Good Fortune, The Bodhisattva Vow, and Meaningful to Behold. Four protections Special qualities of a Buddha through which he or she is able to protect sentient beings from the four maras, or demons. Four ways of gathering disciples The four ways of gathering disciples practised by Bodhisattvas are: (1) pleasing others by giving them material things or whatever they need; (2) teaching Dharma to lead others to liberation; (3) helping others in their Dharma practice by giving them encouragement; and (4) showing others a good example by always practising what we teach. Functioning thing A phenomenon that is produced and disintegrates within a moment. Synonymous with impermanent phenomenon, thing, and product. See also Impermanent phenomenon. Ganden `Tushita’ in Sanskrit, `Joyful Land’ in English. The Pure Land of Buddha Maitreya. Both Je Tsongkhapa and Atisha went to this Pure Land after they passed away. Also the name of the monastery in Tibet founded by Je Tsongkhapa, and of the special doctrine revealed by Je Tsongkhapa. See Heart Jewel. Ganden Emanation Scripture See Kadam Emanation Scripture. Ganden Lhagyäma See Hundreds of Deities of the Joyful Land. Gändhavajra The emptiness of smell appearing in the form of an offering goddess. See Guide to Dakini Land. Gelug The tradition established by Je Tsongkhapa. The name `Gelug’ means `Virtuous Tradition’. A Gelugpa is a practitioner who follows this tradition. The Gelugpas are sometimes referred to as the ‘new Kadampas’. See Heart Jewel. Generation stage A realization of a creative yoga prior to attaining the actual completion stage, which is attained through the practice of bringing the three bodies into the path, in which one mentally generates oneself as a Tantric Deity and one’s surroundings as the Deity’s mandala. Meditation on generation stage is called a `creative yoga’ because its object is created, or generated, by correct imagination. See Tantric Grounds and Paths, Mahamudra Tantra, Guide to Dakini Land, and Essence of Vajrayana. Generic image The appearing object of a conceptual mind. A generic image, or mental image, of an object is like a reflection of that object. Conceptual minds know their object through the appearance of a generic image of that object, not by seeing the object directly. The conceptual mind mistakes the generic image, or mental image, for the object itself. For example, if we think about our mother, an image of our mother appears to our conceptual mind, and it seems to that mind as if our mother herself is appearing. However, the object that principally appears to that mind is the generic image of our mother. This generic image appears to our mind through the mental exclusion of all objects that are not our mother. It is therefore the appearance of a non-non-mother. As such, like all generic images, it is a permanent phenomenon, whereas our mother herself is impermanent. See Heart of Wisdom and Understanding the Mind. 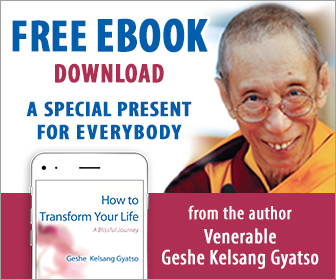 Geshe A title given by Kadampa monasteries to accomplished Buddhist scholars. Contracted form of the Tibetan `ge wai she nyen’, literally meaning `virtuous friend’. Ghantapa A great Indian Mahasiddha and a lineage Guru in the Highest Yoga Tantra practice of Vajrayogini. See Guide to Dakini Land. Giving A virtuous mental decision to give, or a bodily or verbal action of giving that is motivated by a virtuous state of mind. There are four types of giving: giving material things, giving Dharma, giving love, and giving fearlessness. See Joyful Path of Good Fortune and Meaningful to Behold. God ‘Deva’ in Sanskrit. A being of the god realm, the highest of the six realms of samsara. There are many different types of god. Some are desire realm gods, while others are form or formless realm gods. See Joyful Path of Good Fortune. Goddesses of the doorways The four Goddesses of the doorways are Kakase, literally ‘crow-faced one’; Ulukase, ‘owl-faced one’; Shönase, ‘dog-faced one’; and Shukarase, ‘pig-faced one’. Although they have human-shaped heads and ears, their names reflect the appearances of their faces, which are like a crow, like an owl, and so on, rather as if they are wearing masks. Golden age A time when sentient beings have abundant merit and when Dharma activities flourish. It is contrasted with degenerate times. Great compassion A mind wishing to protect all sentient beings from suffering. Generally there are three types: compassion observing sentient beings, compassion observing phenomena, and compassion observing the unobservable. The second is a great compassion induced by and accompanied by a realization of impermanence, and the third is a great compassion induced by and accompanied by a realization of emptiness. The first is a great compassion that is not qualified in either of these ways. See Eight Steps to Happiness, Universal Compassion, and Ocean of Nectar. Great liberation Great enlightenment, or Buddhahood. Great nirvana See Great liberation. Great scope practitioner A spiritual practitioner who emphasizes attaining enlightenment for the benefit of others. See Joyful Path of Good Fortune. Ground/Spiritual ground A clear realization that acts as the foundation of many good qualities. A clear realization is a realization held by spontaneous renunciation or bodhichitta. The ten grounds are the realizations of Superior Bodhisattvas: Very Joyful, Stainless, Luminous, Radiant, Difficult to Overcome, Approaching, Gone Afar, Immovable, Good Intelligence, and Cloud of Dharma. See also Path/Spiritual path path. See Ocean of Nectar and Tantric Grounds and Paths. Guhyasamaja A Highest Yoga Tantra Deity. See Great Treasury of Merit. Guide to the Bodhisattva’s Way of Life A classic Mahayana Buddhist text composed by the great Indian Buddhist Yogi and scholar Shantideva, which presents all the practices of a Bodhisattva from the initial generation of bodhichitta through to the completion of the practice of the six perfections. For a translation, see Guide to the Bodhisattva’s Way of Life. For a full commentary, see Meaningful to Behold. Guru See Root Guru and Spiritual Guide. Guru yoga A special way of relying upon our Spiritual Guide in order to receive his or her blessings. See Joyful Path of Good Fortune, Great Treasury of Merit, and Heart Jewel. Gyaltsabje (AD 1364-1432) One of the principal disciples of Je Tsongkhapa. See Great Treasury of Merit. Gyalwa Ensäpa (AD 1505-1566) A great Yogi and Mahamudra lineage Guru who attained enlightenment in three years. See Great Treasury of Merit. Happiness There are two types of happiness: mundane and supramundane. Mundane happiness is the limited happiness that can be found within samsara, such as the happiness of human beings and gods. Supramundane happiness is the pure happiness of liberation and enlightenment. Harmfulness A deluded mental factor that wishes other sentient beings to suffer. See Understanding the Mind. Hashang A Chinese monk of the twelfth century who propagated many wrong views in Tibet, including the view that the meaning of Buddha’s teachings on emptiness was that we should empty our mind of all conceptions and meditate on nothingness. He was publicly defeated in debate by Kamalashila and banished from Tibet. See Ocean of Nectar and Joyful Path of Good Fortune. Hearer One of two types of Hinayana practitioner. Both Hearers and Solitary Conquerors are Hinayanists, but they differ in their motivation, behaviour, merit, and wisdom. In all these respects, Solitary Conquerors are superior to Hearers. Hearers are of eight types according to the level of delusions they have abandoned. (1) approachers to the accomplishment of a Stream Enterer, (2) abiders in the accomplishment of a Stream Enterer, (3) approachers to the accomplishment of a Once Returner, (4) abiders in the accomplishment of a Once Returner, (5) approachers to the accomplishment of a Never Returner, (6) abiders in the accomplishment of a Never Returner, (7) approachers to the accomplishment of a Foe Destroyer, and (8) abiders in the accomplishment of a Foe Destroyer. A Stream Enterer is on the path of seeing and will never again be reborn in the three lower realms; a Once Returner will return to the desire realm only once more; and a Never Returner will never again return to the desire realm. See Ocean of Nectar. Heart channel wheel The channel wheel (Skt. chakra) at our heart. See Clear Light of Bliss and Tantric Grounds and Paths. Heart Sutra One of several Perfection of Wisdom Sutras that Buddha taught. Although much shorter than the other Perfection of Wisdom Sutras, it contains explicitly or implicitly their entire meaning. Also known as the Essence of Wisdom Sutra. For a full commentary, see Heart of Wisdom. Hell realm The lowest of the six realms of samsara. See Joyful Path of Good Fortune. Heruka A principal Deity of Mother Tantra, who is the embodiment of indivisible bliss and emptiness. He has a blue-coloured body, four faces, and twelve arms, and embraces his consort Vajravarahi. See Essence of Vajrayana. Hevajra A principal Deity of Mother Tantra. See Great Treasury of Merit. Hidden object An object whose initial realization by a valid cognizer depends upon correct logical reasons. See Understanding the Mind. Highest Yoga Tantra The supreme quick path to enlightenment. The teachings on Highest Yoga Tantra are Buddha’s ultimate intention. See also Four classes of Tantra) and Tantra. See Mahamudra Tantra and Tantric Grounds and Paths. Hinayana Sanskrit term for Lesser Vehicle. The Hinayana goal is to attain merely one’s own liberation from suffering by completely abandoning delusions. See Joyful Path of Good Fortune. Holding false views as supreme A deluded view that holds a false view to be correct and superior to other views. See Joyful Path of Good Fortune. Holding wrong moral disciplines and conduct as supreme A deluded view that holds any wrong moral discipline or conduct to be correct and considers it to be superior to other forms of moral discipline or conduct. See Understanding the Mind. Humility A virtuous mental factor whose main function is to reduce deluded pride. Hundreds of Deities of the Joyful Land Ganden Lhagyäma in Tibetan. A special Guru yoga of Je Tsongkhapa in which Je Tsongkhapa and his two Sons are invited from the Joyful Land, or Tushita. See Heart Jewel. Hungry spirit A being of the hungry spirit realm, the second lowest of the six realms of samsara. Also known as ‘Hungry ghost’. See Joyful Path of Good Fortune. Ignorance A mental factor that is confused about the ultimate nature of phenomena. See also Self-grasping. See Understanding the Mind. Illusory body The subtle divine body that is principally developed from the indestructible wind. When a practitioner of Highest Yoga Tantra rises from the meditation of the isolated mind of ultimate example clear light, he or she attains a body that is not the same as his or her ordinary physical body. This new body is the illusory body. It has the same appearance as the body of the personal Deity of generation stage except that it is white in colour. It can be perceived only by those who have already attained an illusory body. See Clear Light of Bliss and Tantric Grounds and Paths. Impermanent phenomenon Phenomena are either permanent or impermanent. `Impermanent’ means `momentary’; thus an impermanent phenomenon is a phenomenon that is produced and disintegrates within a moment. Synonyms of impermanent phenomenon are `functioning thing’, ‘thing’, and `product’. There are two types of impermanence: gross and subtle. Gross impermanence is any impermanence that can be seen by an ordinary sense awareness – for example the ageing and death of a sentient being. Subtle impermanence is the momentary disintegration of a functioning thing. See Heart of Wisdom. Imprint There are two types of imprint: imprints of actions and imprints of delusions. Every action we perform leaves an imprint on the mental consciousness, and these imprints are karmic potentialities to experience certain effects in the future. The imprints left by delusions remain even after the delusions themselves have been abandoned, rather as the smell of garlic lingers in a container after the garlic has been removed. Imprints of delusions are obstructions to omniscience, and are completely abandoned only by Buddhas. Imputation, mere According to the Madhyamika-Prasangika school, all phenomena are merely imputed by conception in dependence upon their basis of imputation. Therefore, they are mere imputation and do not exist from their own side in the least. See Heart of Wisdom and Ocean of Nectar. Imputed object An object imputed by the mind in dependence upon its basis of imputation. See Heart of Wisdom and Ocean of Nectar. Inappropriate attention A mind that focuses on the qualities of a contaminated object and exaggerates them. It is what actually generates delusions. See Joyful Path of Good Fortune. Inconsideration A deluded mental factor that is the opposite of consideration. See Understanding the Mind. Indestructible drop The most subtle drop, which is located at the heart. It is formed from the essence of the white and red drops received from our parents at conception, and encloses the very subtle mind and its mounted wind. These red and white drops do not separate until the time of death, when they open and allow the very subtle mind and its mounted wind to depart to the next life. See Tantric Grounds and Paths and Clear Light of Bliss. Indra A worldly god. See Heart of Wisdom. Inferential cognizer A completely reliable cognizer whose object is realized in direct dependence upon a conclusive reason. See Understanding the Mind. Inferential valid cognizer A non-deceptive cognizer that realizes its hidden object by depending upon a conclusive reason. See Understanding the Mind. Inherent existence An imagined mode of existence whereby phenomena are held to exist from their own side, independent of other phenomena. In reality, all phenomena lack or are empty of inherent existence because they depend upon their parts. See Heart of Wisdom and Ocean of Nectar. Initial scope practitioner A spiritual practitioner who seeks the happiness of humans and gods. See Joyful Path of Good Fortune. Innate delusions Delusions that are not the product of intellectual speculation, but that arise naturally. See Understanding the Mind. Inner Dakini Land A mind of clear light that realizes emptiness directly without a generic image. Synonymous with meaning clear light. See Guide to Dakini Land. Inner fire ‘Tummo’ in Tibetan. An inner heat located at the centre of the navel channel wheel. See Clear Light of Bliss. Inner offering A Highest Yoga Tantra offering that is produced by transforming ten inner substances into nectar. See Guide to Dakini Land. Inner winds Special subtle winds related to the mind that flow through the channels of our body. Our body and mind cannot function without these winds. See Clear Light of Bliss and Tantric Grounds and Paths. Intellectually-formed delusions Delusions that arise as a result of relying upon incorrect reasoning or mistaken tenets. See Understanding the Mind. Intention A mental factor that functions to move its primary mind to the object. It functions to engage the mind in virtuous, non-virtuous, and neutral objects. All bodily and verbal actions are initiated by the mental factor intention. See Understanding the Mind. Intermediate scope practitioner A spiritual practitioner who emphasizes the attainment of his or her liberation from samsara. See Joyful Path of Good Fortune. Intermediate state ‘Bardo’ in Tibetan. The state between death and rebirth. It begins the moment the consciousness leaves the body, and ceases the moment the consciousness enters the body of the next life. See Joyful Path of Good Fortune and Clear Light of Bliss. Investigation A mental factor that examines an object to gain an understanding of its gross nature. See Understanding the Mind. Ishvara A god who abides in the Land of Controlling Emanations, the highest state of existence within the desire realm. Ishvara has limited, contaminated miracle powers that make him more powerful than other beings in the desire realm. If we entrust ourself to Ishvara we may receive some temporary benefit in this life, such as an increase in wealth or possessions, but wrathful Ishvara is the enemy of those who seek liberation and he interferes with their spiritual progress. He is therefore said to be a type of Devaputra mara. Jealousy A deluded mental factor that feels displeasure when observing others’ enjoyments, good qualities, or good fortune. See Understanding the Mind. Je Phabongkhapa (AD 1878-1941) A great Tibetan Lama who was an emanation of Heruka. Phabongkha Rinpoche was the holder of many lineages of Sutra and Secret Mantra. He was the root Guru of Yongdzin Trijang Dorjechang (Trijang Rinpoche). Je Tsongkhapa (AD 1357-1419 An emanation of the Wisdom Buddha Manjushri, whose appearance in fourteenth-century Tibet as a monk, and the holder of the lineage of pure view and pure deeds, was prophesied by Buddha. He spread a very pure Buddhadharma throughout Tibet, showing how to combine the practices of Sutra and Tantra, and how to practise pure Dharma during degenerate times. His tradition later became known as the `Gelug’, or `Ganden Tradition’. See Heart Jewel and Great Treasury of Merit:.